Though the weight limits can fluctuate, based on a variety of factors, a fully loaded commercial semi or tractor-trailer can haul as much as 80,000 pounds on New Jersey’s highways. If you’re a passenger in an automobile and you are involved in a collision with one of those behemoths, the consequences are almost always serious and catastrophic. Unfortunately, such accidents happen far too often and for many different reasons. Here are two of the most frequent causes of large truck accidents. Because of the known risks posed by big rigs, state and federal legislatures have implemented specific regulations: restrictions on the amount of time drivers may spend behind the wheel during a given period, and regulations requiring regular maintenance of vehicles. Often, though, because drivers are paid by the mile, there’s enormous pressure to skirt or ignore the regulations, leading to serious accidents caused either by driver fatigue or by mechanical failures. 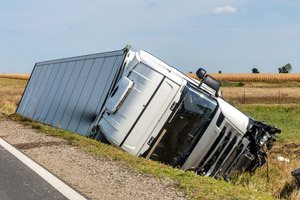 To learn your options after suffering an injury in a commercial truck accident, contact our office online or call attorney Popper at 973-993-8787. We have offices in Morristown and Newton, but will come to your home or the hospital, if necessary. There is no charge for your first consultation.